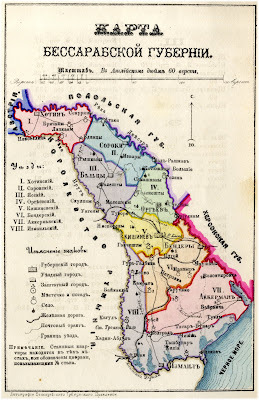 Greetings from Edinets, Republic of Moldova! We are in Edinets, a town in the northern part of the Moldovan Reublic as a part of Alan Bern's The Other Europeans project, which we participated in during the summer in Weimar, Germany. Having met the wonderful Moldavian lautar violinist Marin Bunea -and his ethnomusicologist wife, Diana Bunea - we are now traveling around Moldova listening and learning from the Moldovan lautar tradition. 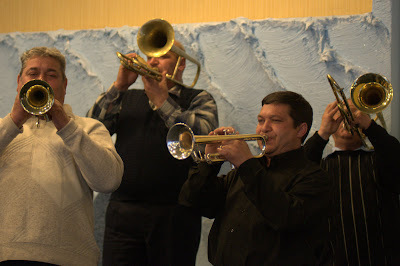 It's a brass folk tradition that hasn't been heard much outside of Moldova, but is also probably one of the few living traditions that has very close roots to the origins of modern Klezmer music. 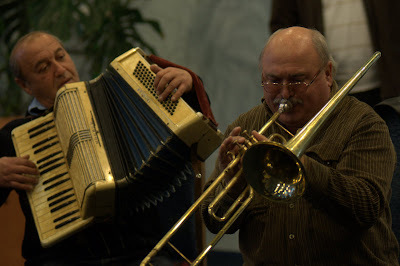 What is interesting here in the north of Moldova is that the Klezmer influence was so closely intertwined with local music that the local non-Jewish slang term for a musician is "klezmeras". We've been spending a couple of days trading licks and ideas with some great musicians. This morning we visited the Jewish cemetery of Edinets with Zev Feldman. Zev - who was one of the founders of the klezmer revival in the 1970s - has family roots in Edinets, and so it was moving to visit the boneyard with him. That's Zev, dressed as an extra in the film Dr. Zhivago. A taste of what Mark Rubin is missing: north Moldavian brass lautar with cimbalom, heavy on the valve trombones. 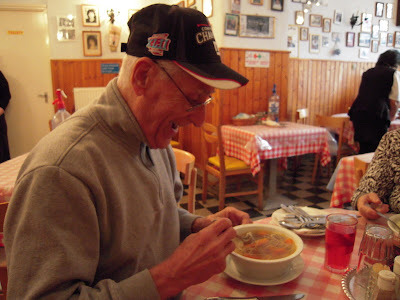 A lot of customers come in to the Kádár and only order the filling, cheap soup and a dessert. It's an older way of dealing with lunch - soup and sweets. The desserts are an edible museum of old Magyar home style sweets, from back in the day when the dessert course was just as important as the main course in filling you up with cheap starch. 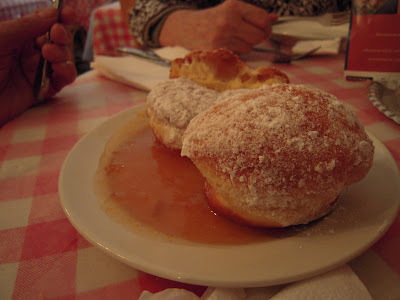 Our choice was fánk, which is, essentially, donuts, except the Hungarian donut is a ball of sweet fried yeast dough dusted in sugar and the jam is spooned over it. Doh! 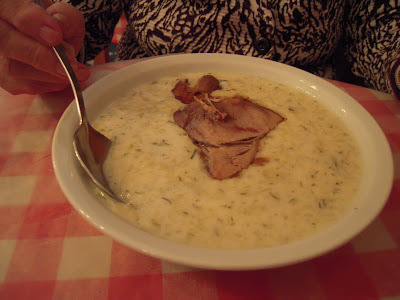 Other Kádár options might include várgabéles, sweet bread cubes swimming in vanilla sauce, or any of a load of grandma era afters like mákos tészta, poppy seed and sugar sprinkled on spaghetti, which is usually eaten as a main course (and was the source of Primo Levi's disdain when, after being released from Auschwitz, the pasta loving Italian Jewish writer was interned for a year in a transit camp with Hungarian Jewish cooks.) Or, you can stroll three blocks away down Dob utca for a visit to Frölich Cukrászda, the last of the old style kosher pastry and coffee shops in the Ghetto. Frölich's is famous for flodni, the ultimate Budapest Jewish pastry: poppy seeds, apple, and nuts sandwiched in a pite pastry sandwich. This is the stuff that was the cause of the famous flodni-gate episode two years ago during which local bloggers Judapest.org mercilessly mocked the officially recognized Jewish community organization by presenting a flodni to Hungarian president Sólyom László . This isn't the Jewish pastry that we know from growing up in Galicianer-influenced New York City, but I'll soon be on the road looking into the origins of some of that. I am heading out to the fabulous Republic of Moldova on friday... palm trees... tropical drinks... sandy beaches... Aloha Moldova! I'll be with a lot of the teaching staff from the Weimar Yiddish Culture weeks with whom I worked in the summer - Alan Bern, Zev Feldman, Kalman Balogh - visiting lautar musicians in Edinets and Chisinau, and basically spending a week in the poorest nation in Europe - the birthplace of my paternal grandparents, and hopefully, get a chance to visit the shtetls where they were born. More soon... gibt mir Bessarabia! Hungary is notable as a destination for dental tourism. Apparently, much of the civilized world is under the impression that having a set of usable teeth should be way out of the price range of anybody who might ever want to chomp down on a chicken leg or eat an ear of corn on the cob. Dental prices in the United State are insane, and no, they are not covered by your health insurance if you are lucky enough to have any. My father needed a set of dentures and the American dentists he went to were quoting him prices of around USD $16,000. Holy frigging molars, that's enough to buy a new car... and so for about one eighth of that price, my Dad had his teeth fixed and new dentures made in Hungary. Part of the visit consisted of cooking soft things for my Dad to eat while he waited for his teeth to get made. The other part of the visit was watching my parents roam the city and eat everything in sight. My Mother is Magyar - born and raised - and so this was a chance to rid her homeland of its chestnut purees. Chocolate mousse "cat's toungue" cakes at the Europa cafe? Gone in a second. 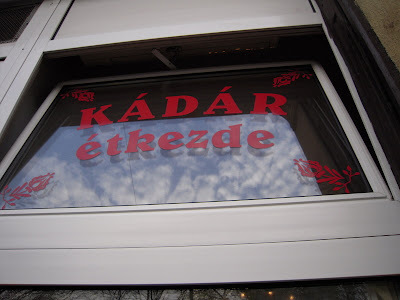 Their favorite discovery was the tiny Kadár Étkezde for lunch - so much so that I will post about that separately in a day or so. We spent the weekend in Veszprém - it was nice to get the parents out of Budapest - especially since my mother was born and raised here and left during the second world war. Visited relatives, cemeteries, and of course, ate far better than I ever do in Budapest, especially at the Óvaros Restaurant, located at the entrance street leading to the Veszprém castle. Below: pork ribs in spicy gravy with paprika mashed potato. All around favorite: goose leg with red cabbage. Compared with eateries in Budapest, the food in the countryside is better: maybe the cooks are more professional, or they can't just quit and go to another establishment in a small town, but the dishes we had were far better, and less pretentious, than what I expect in the capital city. And cheaper, by about 50%. My Dad likes castles, which is understandable since there are precious few medeival monuments in New Jersey. Unfortunately, I do miss the exquisite White Castles that we have in Jersey, but that is a different story. And my Mom got to visit her old home town and point out her old school and the street where she learned to be a seamstress. Visited the relatives, living and dead. My good buddy Bruce "Bubba" Lewis did me a great favor in driving my folks and I out to Veszprem... I was lucky to grab him on one of the few weekends when he isn't playing any gigs in Budapest. My Dad was impressed when he found out that Bruce's grandfather was the former Governor of Kentucky, "Happy" Chandler, who went on to become the second USA commisioner of Baseball - the man that forced the major leagues to integrate. My Dad was a big Brooklyn Dodgers fan, and Brooklyn was the first team to include a Black player - Jackie Robinson. At the time, the other baseball team owners voted 15-1 against integration. Another case of New York leading the way in hand with Kentucky. And now we have an African American president elect. My, my, how times have changed. So Bruce and the Pops hit it off just fine. And now my father has Bruce's CD playing non-stop on his ipod. Extremely strange. Bruce and I go wayyyyy back. We met at Boston University back in the pleistocene era, before the ice sheets separated us. With the end of the Ice Age, Bruce came to Hungary on a gig, and the Hungary Effect took hold, leaving him married, with two kids, a house, and no access to life-giving White Castle hamburgers. But we survive. With much less hair, I'll admit, but we survive. Bay State Road, Boston Mass. USA... 1977. What more can I say on this wonderful November morning.